One of the most common disagreements between the old guard and new of Jewish education is about the use of technology in the classroom. Some see technology as a largely untapped resource that can add another level of relate-ability to our students while other believe it is an unnecessary distraction. When utilized correctly technology opens up a Pandora’s box but once it becomes a distraction it may become impossible to rein students back in. Before delving into the pros and cons of technology in the classroom we must first identify what forms of technology we can utilize. Many believe that tech starts and ends at computers but computers are only the tip of the iceberg. We live in a fast moving technologically adept world in which new technologies are constantly being developed. When Smart Boards were first rolled out they appeared to be the end all be all of educational technology. While it would be nice if there could be a Smart Board in each classroom across the country that is financially improbable. Instead of ending the search for plausible classroom technology after seeing the cost of a Smart Board, we must look at what devices our students already use. Smart phones, I-pads, windows tablets, e-readers, I-pods, smart watches or other wearable tech, lap tops, electronic picture frames, and even Bluetooth speakers are, at times in our classrooms, without our knowledge. These devices, as well as others not listed above, are accessible to us but often times are just out of reach. When we are able to get cellphones out of pockets or tablets out of back-packs we can begin transforming our student’s classroom experience. 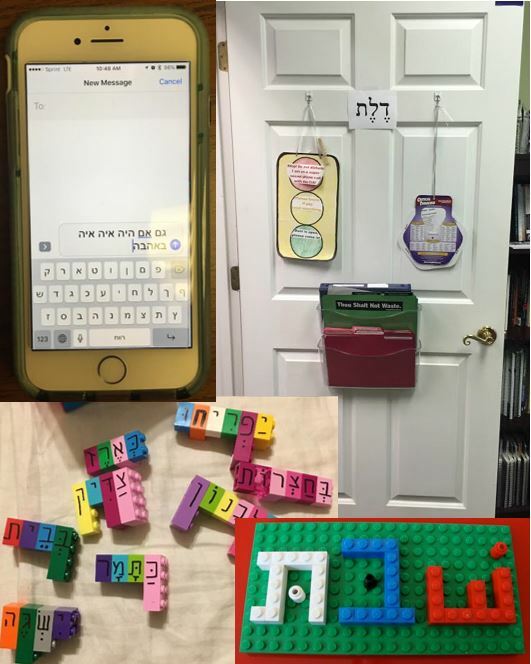 By using technology educators are showing their students new ways to interact with Judaism. Instead of reading about a holiday and crafting a take home project students would have the ability to use websites like Animatron to creatively adapt the holiday or story. Animatron provides students with a platform to visualize, through animation, the stories they have been learning. Breaking the technology barrier also provides students with new ways to organize their thoughts. Tools like Poll Everywhere all students to track their own learning by texting in to a word cloud generator. This world cloud generators and others like it provide classroom educators has a new way to ensure that their students are retaining information. The list of potential useful websites is endless and is only contained by your individual needs. Not everyone feels that technology is such a useful tool but rather that is more of a detriment to classroom learning. As previously stated, stepping into the digital world opens a Pandora’s Box - a box not easily compartmentalized and controlled. With your internet browser of choice open students do have access to the depths of the World Wide Web and that can be disconcerting. The last thing educators want is their efforts to backfire because of a student’s inability to stop clicking on links they do not know or know they should not be clicking. One of the most asked questions regarding tech in the classroom is “how do I know my students are actually doing their work and not playing games or on Facebook?” There is no simple solution to this concern. There has to be a certain level of trust between teacher and student. If you as a teacher feel that you cannot trust your students to stay on the designated websites you may have to take laps around the room checking in on each student. For some, learning how to use new technologies can be daunting but many companies have online video tutorials to help quell any anxieties about trying something new. Ultimately, every Religious School educator is attempting to accomplish the same goal. We want to provide a meaningful education to each student who walks in our door. To do this we must constantly be reevaluating how we inform our students. As our students interest change we attempt to reach them on their level, always.